Evans Orchard and Cider Mill is a 5th generation family farm. Today we focus on providing great family entertainment, as well as healthy, farm-fresh fruits and vegetables. 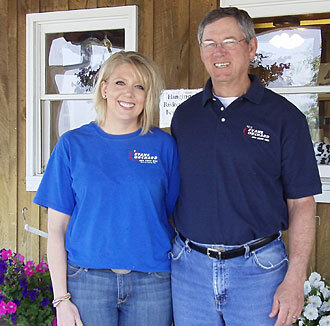 The farm is family-owned and operated by Kevan and Sue Evans and their daughter, Jenny. Kevan’s great, great grandfather started the farm, raising tobacco and cattle. These were our primary products until the early 1990s, when Kevan began growing vegetables and apple trees as alternative crops. Imagine the discussions he had with his father, when he wanted to start planting trees and his father had spent much of a lifetime clearing trees off the land! Today, the farm covers 175 acres, with 15 acres of apple and peach orchards and more than 20 acres of vegetables that are fresh-picked and sold in our own Farm Market and at area farmers’ markets. Our beautiful Farm Market & Gift Store was once the tobacco barn, but now offers shoppers an extensive selection of fresh fruits and vegetables, fresh honey (from bees on the orchard), fresh jams and jellies, and, of course, fresh pressed apple cider. Adjoining the Farm Market, the original shed now has been converted to the Sweet Apple Café and Bakery and now contains our certified kitchen, offering guests an extensive selection of hamburgers, hot dogs, rib-eye sandwiches, grilled chicken, fried apple pies, homemade fudge, and much more! Major responsibilities for the farm are assumed by the Evans family. Kevan takes care of all the production of vegetables, fruit, cider, and the wholesale orders for these farm products. Jenny manages the store and kitchen, organizes the school tours and festivals, and oversees marketing. Kevan’s mother lives on the farm, and helps here and there, answering the phone and filling in where she can. “Truth is,” Kevan said in an interview, “it was kinda scary when we did our first year without tobacco.” But today, the farm has a diversified variety of apples, peaches, asian pears, and more than 25 vegetables for sale, not to mention a growing number of guests visiting the pumpkin patch, and play areas, and just having a great day at Evans Orchard.